I know what it looks like. I know it looks like poop in that bowl. But please believe me when I say: that’s not poop. What is it? Well, only the most magical toddler food on the planet!… Avocado chocolate pudding. Sort of. It’s time for an update, folks. It’s been awhile, and I do sincerely apologize to everyone (all two of you, plus my mom) for the hiatus. Our lives are a bit topsy-turvy at the minute, and without getting too far off-track, we are living our maaavalous lives in a wee-little apartment that teeters around 450 square feet or so. It’s adorable. It’s quaint. It’s cozy. Just dear God, don’t let anyone fart. But it’s the mom update you’ve come for, so let us resume. We’ll start with that pudding. Step 1: Cut and scoop out guts of one avocado. It’s important to monologue everything you’re doing as you prepare the recipe in the voice of Kermit, a fictional mouse you just made up, or by just adding “Yummmm” excitedly after each step. They love this. Or at the very least, will stop and stare. Deliver this concoction to your toddler and watch them eat the entire thing (along with the bowl itself – see picture above). Not only are you a culinary genius for making such a complicated recipe, you are a top-brass momma for giving your toddler sweets that really aren’t real sweets. They’ll have no clue that, instead of decadent chocolate pudding from a Paris chocolaterie, they’re actually eating one of the best toddler super-foods: avocados. I had tried getting Bubbalooshki to eat avocados, but he poo-pooed them (get it – hee hee). But, na-na-na-na-boo-boo, I’m smarter ‘cuz I tricked him. It’s delicious, healthy, easy, and pretty cheap. Boom. Award? Yes please. We’ve also recently tried avocado pancakes with chocolate chips. Also a huge success and another great way to sneak brain-food into a toddler diet. Voila. You’ve just created an extraordinarily enchanting other-world of wonderment. Watch them squeal, giggle, run in, run out… Forts. Amazing. Make yours today. When pudding and forts fail, take your toddler and just fling them onto a bed while yelling, “Weeeeee! BOOM!” Then take your turn after an exaggerated count to three as you cannon-ball onto the bed with them. Note: Standard beds are not built for two adults and one 22 pounder taking a running start from across the room and dive-bombing repeatedly. Have a screwdriver handy for repairs and drape the bedposts with a dish towel or stocking hat to avoid putting dents in the walls. One final toddler-whisperer trick I simply must share is to involve your wee one in household chores. This usually works, and it’s no secret, really. Kids love unfolding your folded laundry, sweeping crumbs around the house, and rubbing their greasy hands all over the window in a wiping fashion. But to buy yourself some time when the usual, “Ooooh-lookie-take-this-paper-towel-and-go-wipe-stuff-with-it-Yay” trick doesn’t work, pull out the hand-held vacuum. Bubbalooshki loves it and, if I’m being honest, he doesn’t do a half-bad job. In fact he does a half-good job. If you point to the crummies, he sweeps ’em right up. Just don’t try to take the sweeper away. Or you’ll cancel out any anti-tantrum magic. Let’s all help each other out here. 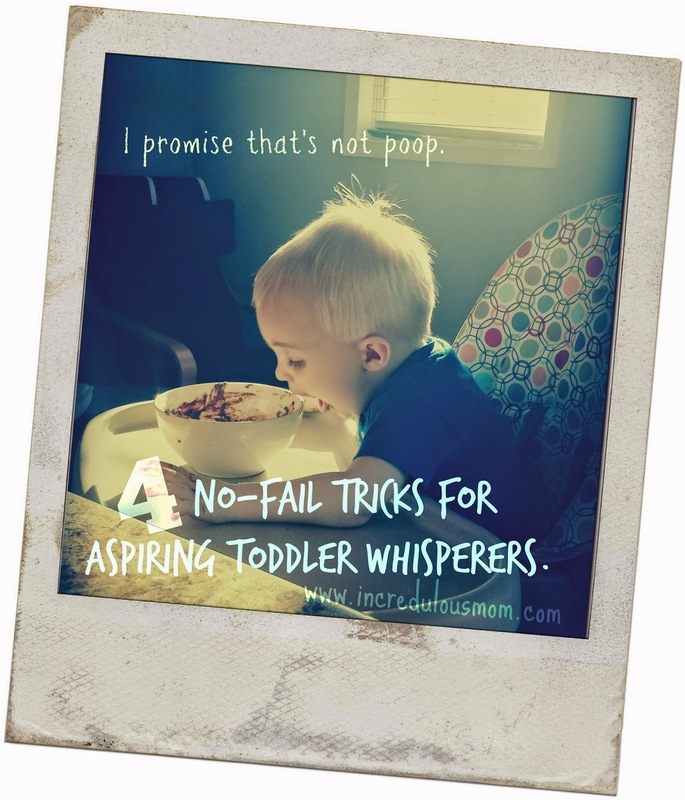 Does anyone else want to share their toddler-whisperer secrets? I, for one, would certainly love to add any more anti-tantrum antidotes to my secret book or anti-tantrum antidotes. Moo-ha ha ha ha! Incredulous Tip # 21 : Toddlers are strange little creatures. Come to terms.